Founded as a settlement at some point around 5000 BC, the area was originally home to a small Neolithic fishing community. It is located in modern Lebanon (now the prosperous city of Jubayl, on the Mediterranean coast - the name is the modern form of Gebal), about 42km (26 miles) north of Beirut. The first signs of a town appeared in the third millennium BC, and by the beginning of the Early Bronze Age in 3000 BC it was a prosperous Canaanite city with one of the most important timber trading centres on the coast, and close ties with fourth dynasty Egypt. It quickly developed from there to become one of the main importers of luxury goods, and a key exporter of papyrus to Greece. Originally known as Gubla, and then Gebal, the later name Byblos comes from the Greeks, from those imports of papyrus (or bublos). Egypt maintains a trading presence in the region following links which date back a further millennium. Byblos is overrun and burnt by Amorites during the period of disturbance which follows the collapse of Sumer, but they quickly settle in, rebuild the city, and resurrect trade. Little information is available on the earliest kings, save their names. 'Mayor of Gebal'. Vassal of Egypt. Exiled and killed. Relations with neighbouring Amurru are soured by constant complaints from Rib-Adda to his overlords in Egypt that Aziru, the king of Amurru, is trying to overthrow him and force others to join the pro-Hittite camp in local politics. The Egyptian pharaoh only gains a temporary respite when Aziru dies, as Rib-Adda quickly renews his feud with Aziru's sons in Amurru. He also complains vociferously about Yapa-Hadda of Biruta, accusing him of always plotting or committing crimes. Rib-Adda reports to his Egyptian overlords that his kinsman, the king of Tyre, and his family have been murdered in a coup d'etat. As Rib-Adda had been keeping his own sister and daughters safe there from Amurru's raids, they are presumably also amongst the dead. To make matters worse, Rib-Adda is temporarily forced to flee his city and seek protection with Ammunira of Beyryt in the face of raids by the Hittites, as well as devastating attacks by the habiru. Brother. 'Mayor of Gebal'. Vassal of Egypt. Exiled Rib-Adda. There is general collapse in the region as instability grips the Mediterranean coast and the Hittite empire is destroyed by the Sea Peoples and other various surrounding groups. Arvad, Gebal, Sidon, and Tyre, all with prominent harbours, manage to survive unscathed, although the wealthy customers disappear for a time. 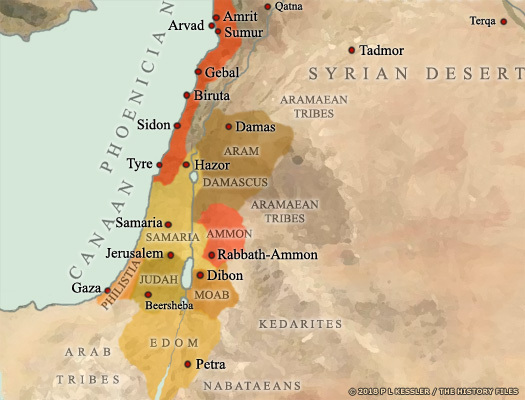 Descended from the Canaanites who formerly inhabited the entire Levant region, these later Canaanites occupied the long coastal strip that forms modern Lebanon. According to their tradition the city was founded by the god El, and even they considered it to be a city of great antiquity. By at least 1200 BC, the scribes of Byblos were responsible for developing an alphabetic phonetic script which was the precursor of the modern alphabet in the west. By 800 BC it had travelled to Greece, and through the later Greek empire it found acceptance throughout the civilised world. During the first millennium BC, Byblos continued to benefit from trade in spite of Assyrian and Babylonian encroachments, until it was submerged within the Persian empire in 539 BC. A weakened Egypt loses its remaining imperial possessions in Canaan. Whether Zakar Baal rules before this point or is the first to assume power in the city after the Egyptian withdrawal is unknown. His successor, Ahiram, is eventually laid to rest in a sarcophagus which carries the (to date) oldest-known inscription in the Phoenician alphabet. Byblos loses its position as pre-eminent city to Tyre when that city gains control over the state. Tyre gains control over Byblos and Sidon. Troops from Byblos are members of an alliance of states which also includes Ammon, Arvad, Damas, Edom, Egypt, Hamath, Kedar, and Samaria. Together they fight Shalmaneser III of Assyria at the Battle of Qarqar which consists of the largest known number of combatants in a single battle to date, and is the first historical mention of the Arabs from the southern deserts. Despite claims to the contrary, the Assyrians are defeated, since they do not press on to their nearest target, Hamath, and do not resume their attacks on Hamath and Damas for about six years. Byblos becomes tributary to Tiglath-Pileser III of Assyria. With the death of Sargon II of Assyria, many of the former subject states rebel. It takes the Assyrians until 701 BC to get around to quelling the Phoenician states. In Byblos, subject kings are allowed to remain in power, at least during the later stages of Assyrian rule. With the fall of Assyria, Tyre appears to restore its control of Byblos. Byblos and all of Phoenicia is submerged within the Persian empire, which appoints local governors. Part of the empire, Byblos was the fourth of four Phoenician vassal 'kingdoms' to be established, although it was controlled by governors in the name of the Persian king. The remains of a fortress outside the Early Bronze Age city walls from this period show that Byblos was a strategic part of the Persian defence system in the eastern Mediterranean. In 334 BC Alexander of Macedon launches his campaign into the Persian empire by crossing the Dardanelles. Much of Anatolia falls by 333 BC and Alexander proceeds into Syria during 333-332 BC to receive the submission of Ebir-nāri, which also gains him Harran, Judah, and Phoenicia (principally Byblos and Sidon, with Tyre holding out until it can be taken by force). Athura, Gaza, and Egypt also capitulate (not without a struggle in Gaza's case). Byblos becomes part of the new Greek empire and is quickly Hellenised, with the region's governorship being based in Tyre. The imperialistic ambitions of Armenian King Tigranes lead to war with Rome, and a defeated Armenia becomes tributary to the republic following the campaigns of generals Lucullus (69 BC) and Pompey (67 BC). Former Seleucid Syria is lost and, in the following year (68 BC), so is Byblos. Rome now controls much of the region. Events for Byblos now follow the general sequence of events for Phoenicia.